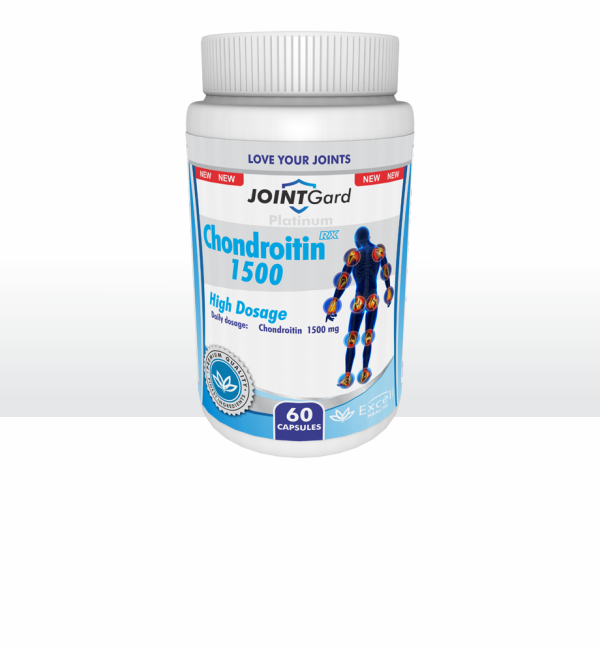 Chondroitin 1500 is a high potency superior joint support formula which is safe to use for people that are allergic to shellfish and Iodine.It supports healthy joint cartilage. Unhealthy and inflamed cartilage is responsible for painfull, swollen and stiff joints. Chondroitin sulfate is a promising treatment for Osteoarthritis. It is an effective treatment for Osteoarthritis of the finger, knee, hip joints, and lower back. It is a slow-acting medication that may lead to reduced doses of other arthritis drugs. Chondroitin is a major component of cartilage that helps it retain water and is an effective treatment for people who have overactive bladder function(Frequent urination). Reduces pain and inflammation, improves joint function and slows progression of osteoarthritis (OA). Enhance the shock-absorbing properties of collagen and block enzymes that break down cartilage. Helps cartilage retain water and may reverse cartilage loss. People who have asthma, or prostate cancer, or who are allergic to sulfonamides should not take chondroitin supplements without consent from their Healthcare Professional. Chondroitin should not be taken by people with bleeding disorders and people who are taking blood thinners. Chondroitin seems to be safe for most people. Side effects are rare. Some people have reported headaches, mood changes, rash, hives and diarrhea If you have any side effects, stop taking the supplement and see a doctor. Chondroitin supplements could interact with drugs like blood thinners.